With the advent of “improved equipment sensor & wireless communications technology”, we have tapped into this world of smart technological advances – “Industrial Internet of Things – (IIOT)”, to create that silver-bullet that can now guarantee the assurance for sustainable delivery of improved productivity results. In fact, clients have experienced upwards of 10 – 15% savings in energy and some are now using this platform to tee-up significant potential to drive reductions in operations and maintenance costs. We can quickly mobilize to pilot a low-to-no cost demonstration of your energy savings potential and build an overall business case for longer term delivery of execution excellence. 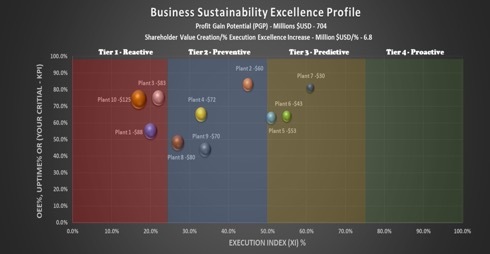 We refer to this development as Proactive Sustainable Profitability – (PSP) and it builds upon an on-going framework for reducing Operations, Maintenance & Technology (OMT) costs, driving smarter decision-making while also providing a leadership monitoring system to drive sustainable profitability and minimize overall business risks. It is cost effective, easy to implement and you will start seeing ROI results within months. Many companies are locked into the vicious financial growth profile as shown below and are leaving upwards over “30% hidden potential” on the table due to in-effective decisions that negatively impact profitability ratios like ROA%, ROIC%, and ROE%. This represents millions of dollars available to deliver significant company shareholder value. Are you among those that are ready reverse those decision-making process and extract these potential gains from your existing asset base? In this article, Profit-Ability LLC – (PALLC), will discuss an innovative new era for providing a renewed focus for growing on-going sustainable profitability and delivering more significant profits thru IIOT – Smart Technologies & Integrated Best Practices for driving Operational & Reliability Excellence. Our view for executing continuous improvement is consistent with the views of Dr. Chakravorty at Kennesaw State University in Kennesaw, Georgia. We have utilized one of his concepts to frame the dialog for this article. So, let’ start the discussion. What do diets, weight-loss plans and process-improvement programs such as Six Sigma – “DMAIC”, TQM and RCM have in common? They typically start off well, generating excitement and great progress, but all too often fall short of the success of having a lasting impact. Many lack leadership follow-up, motivation and gradually fall back into old habits as shown on the right. 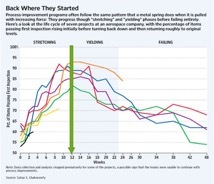 Over time, at about week 12, improvement projects begin to decline and failed vs. original objective. Many companies have reported that less than 1 in 5 has come away less than happy and these programs are left with a “black-eye”. So why do so many of these initiatives fall short of delivering sustainable results when the base methodology or principles are totally sound, valid and valuable? It is our observation for Six Sigma, in the “C-Control Phase” for “DMAIC” projects, they focused to leave a control plan place but lacked the ability to integrate into an overall leadership monitoring process for assuring delivery of proactive sustainable improvements over-time. In our opinion, this is the opportunity for the new era of integrating (PSP) into your culture. Over the years, PALLC has listened to top leadership executives, collaborated with industry experts and have applied those learnings to develop this unique & revolutionary offering. 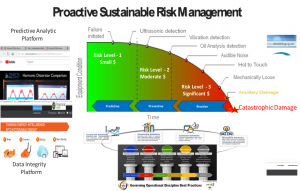 It builds on proven strategies & methods already in-practice for Process Safety and Asset Health, Energy & Risk Management. PALLC patented approach, QMAX$®, deploys the perfect blend of Theory of Constraints, Six Sigma, Reliability Analytics and Lean Thinking to develop that perfect blend for continuous improvement and delivering sustainable results. Along with our collaborative partners, we can now offer many industry sectors this unique and robust solution that now affords companies a proactive way to stay on top of sustaining improvements. In fact, our entire delivery process follows the strict project methodology of Six Sigma and Capital Project Best Practices for effective prioritization and cost containment. PALLC has launched this “new era” that utilizes big data through predictive risk analytics and software solutions that can be harnessed to improve process safety and reliability for continuous and batch operations. This covers operations such as refining, petrochemical, power, energy, mining, food & beverage, transportation, healthcare and manufacturing. We have concluded that utilizing the identified key improvement variables that drives sustained profitability should be harvested and integrated into a proactive performance monitoring system that includes ALL improvement project control plans at the touch of a button for any company. Our unique analytical suite of software tools, best practices and training includes a focused ability to gauge on-going overall execution excellence performance. Our unique software is capable to gather “Voice of Customer”analyzing your data in a way that will present a clearer picture of your asset health and risks so that your teams will be able to understand the “Voice of Process”and execute steps to proactively improve your overall performance. We can handle your big data and uncover budding or latent problems hidden in your process data. We have also incorporated a unique “Data Collection System” that will make easy access and retrieval of process and equipment failure data. The ‘good projects’ that may have been missed in the past will now become obvious. Along the way, we will work side-by-side with the customer to execute a focused way to develop an effective improvement roadmap. We will facilitate harvesting customer value via our 5-Pillared framework to facilitate dependability in managing overall excellence in operational execution & discipline to drive focused improvement solutions to achieve the desired bottom-line profits. We accomplish this value creation thru our network of seasoned and knowledgeable resources. Our prescribed structure will apply relentless execution of governance like capital project best practices across the components of the following 5 Pillars to achieve sustainable productivity and excellence for our customers. Finally, once these critical process issues have been identified and the risks understood, we work with your leadership to customize and execute your integrated system and dashboard to ensure these issues are addressed, remedied, and sustained. Often, near-misses or potential upsets are identified, adding deeper level of urgency to making sure these projects are delivering the on-going profitability and results. 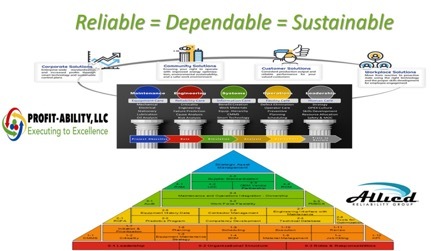 PALLC has clearly set our mission to pioneer an integrated technique that drives effective monitoring of holistic increase in process reliability and provide many business sectors with a dependable way to manage risks associated with sustainable continuous improvement. We have advanced our passion by integrating recently advanced smart technologies, together with key best practices and analytical tools to drive assurance that improvement gains are EXECUTED and being sustained across your entire business enterprise. Driving focused execution is our competitive advantage to deliver your enterprise business case & roadmap for sustainable profitability. In the following example, we have determined this company can deliver $6.8 Million per each 1% increase in execution excellence. We are ready to deliver your results starting with our complementary diagnostics for Energy Optimization and Asset Health & Risk Management. So, you have been looking for that silver-bullet to make substantial improvements in profitability and have attempted or implemented improvement programs like Six Sigma, Lean Manufacturing and Reliability. You have achieved some success, but it has not been sustainable. Some studies suggest that nearly 70% of all company improvement initiatives did not sustain the desired results. In our research, we have observed that in the past, the above programs receive a “black-eye” and were implemented in a silo’ed fashion. They did not have an integrated system for maintaining the gains thru on-going monitoring of financial results long-term. We have observed many companies are now focusing on their top priorities to reduce energy costs. We feel this is an excellent opportunity to link cost reduction with improvement potential to pave the way for executing to World Class Operational Excellence (WCOE). We have clearly set our mission to pioneer an integrated improvement system that begins with a laser focus in improving energy optimization as the foundation. With the advent of improved equipment sensor & wireless communications technology, we have tapped into the world of smart technological advances & industrial internet of things (IOT) to create that silver-bullet that can now deliver results for sustainable WCOE. It builds upon an on-going framework for reducing Operations, Maintenance & Technology (OMT) costs, driving smarter decision-making while also providing a system to minimize overall business risks. 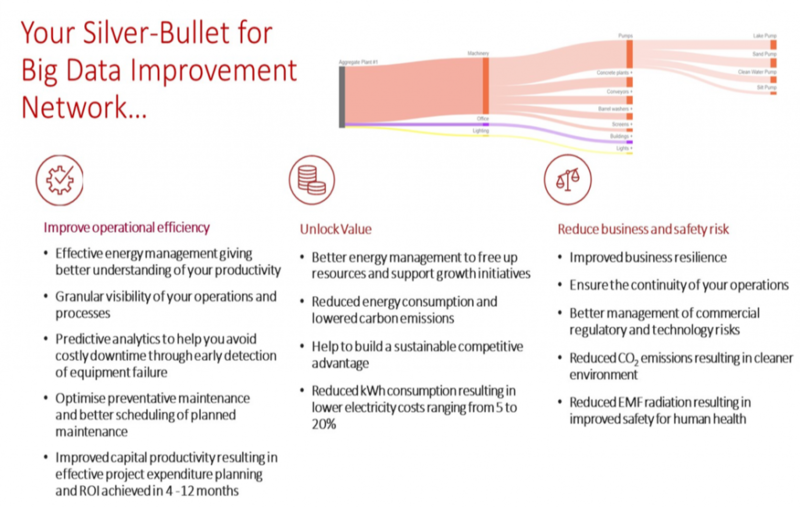 The silver-bullet is the savings from energy optimization can then be utilized to self-fund the WCOE improvements to quickly attack “the hidden plant”. This focused approach will propel your performance journey across our cutting-edge “5 Pillars” for executing excellence to pave the way for WCOE. We have also embedded proactive advanced analytical features in our system that will facilitate proactive monitoring for improvement gains and drive sustainable profitability that was missed in the past. Energy optimization is the one area where significant hidden potential can reside and often represents low hanging fruit that can be quickly harvested in terms of increased profitability. Opportunities to enhance efficiency, avoid waste, and increase equipment longevity through the utilization of energy optimization. Leveraging these opportunities can require a no risk approach to reducing electricity consumption. Our approach combines Profit-Ability LLC’s cutting-edge business execution & asset best practice solutions, Panoramic Power’s cloud-based big-data proactive decision-making management platform and ONICS’s advanced passive technology for Total Harmonics Distortion (THD) reduction to begin maximizing for sustainable profitability in your business. The impact of THD in the energy distribution system has increased over the last few decades. Our solution extends the useful life of inductive equipment in factories, offices and retail space. These devices consume more than 50% of the energy used in industry and commerce. The environmental impact of our work should not be overlooked as it helps to reduce EMF radiation in the workplace as well. We know that the key to success in these efforts for any organization is recognizing and accepting these opportunities to become more effective and engaging in initiatives to bring enhanced energy optimization to daily operations. We partner with clients in their efforts to continuously lead and learn to engage & achieve for sustainable profitability required for their stakeholders. Energy optimization is just one area of expertise available from the team at Profit-Ability, LLC. We are also passionate about helping you identify sustainable solutions to help you better utilize precious resources and Get Your Profits Back on Track for your stakeholders. Sometimes moving an entire organization pales in comparison to adjusting the mindset of one manager. In 2008, I was in an engineering support role and wanted to implement a process reliability approach developed by H. Paul Barringer in the mid-90s (a mentor of mine at the time) to quantify the hidden-opportunity to improve overall reliability, not just equipment reliability in the Oil & Gas Industry. As part of the Six Sigma Greenbelt Project that I used to implement this approach, I was able to quantify 30% of hidden capacity in the company assets while in a sold-out market. The company was considering a $500 million capital project to address this shortfall. A senior and influential business manager reviewed the results of this project and concluded the results were flawed. He stated that because the business was making a lot of money, he didn’t even believe that the plants were performing this poorly. He further voiced that even if portions of the analysis were correct, the report did not tell them what to work on to extract more capability, and therefore was of no value to the company. Of course, the resistance of this manager made me wonder if the hill was even worth the climb to continuing pursuing the Barringer approach within this company. I started thinking that perhaps he had a problem with the fact that the analysis pointed out certain management issues as contributing factors to hiding this capacity in the first place and therefore he rejected the approach itself. A few other managers were intrigued with the results and would offer their support if I could also use the approach to define specific improvement projects to release the hidden capacity identified. I contemplated that an integration of simple Monte Carlo analysis combined with Barringer Process Reliability could meet this challenge. I saw the global impact this could have and developed a passion to drive this into the very fabric of my business. 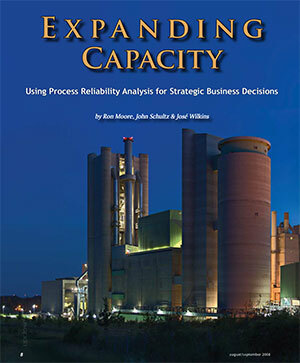 Process Reliability as developed by the late H. Paul Barringer is all about driving effectiveness in management. Paul has since passed on and handed the baton to me to carry on the education of Process Reliability. I, like Paul, am developing my organization to bring his dream to reality. I have overcome many pitfalls and resistance over the years. I have learned to address the skepticism by customizing this process according to the specific needs of each business. I’ve developed a holistic approach for a business case for leadership development vs. a perceived blame on management. I call this solution “Profit-Driven Process Reliability”. TO ACHIEVE World Class Excellence (WCE) REQUIRES THAT AN ORGANIZATION ACHIEVE PROFIT-DRIVEN PROCESS RELIABILITY THROUGH CONTINUOUSLY EXECUTING AND IMPROVING IN ALL SYSTEMS. A HOLISTIC APPROACH OR PLAN MUST INCLUDE A FOCUSED BLEND OF PEOPLE, TECHNOLOGY, AND PROCESS IMPROVEMENT INITIATIVES. Many companies have embarked on an asset management or continuous improvement journey but have fallen short of achieving world class and high cultural performance. They may never realize or sustain the full potential of having this competitive advantage. Historically, 3X the organic revenue growth in future years is generated through strategic execution of innovation for new processes and product programs. An additional benefit is that it also sends positive signals to the marketplace that the company is executing breakthrough operational excellence technologies that will drive sustainable profitability. In my 35+ years of global consulting experience with Fortune 500 companies, I have observed these organizations commonly thrive on heroic reactive actions to get business, operational failures back on track. They failed to answer, “Could proactive measures have prevented those failures and elevated the business operation to a higher level in the first place?” In many cases, proactive measures would have created a remarkable benefit, but instead, it went unrealized. is defined as a talent or quality which is unusually good and so surpasses ordinary standards. It is also an aimed for a standard of performance. quite literally means the carrying into effect of a prior policy or decision resulting in some level of performance. is a suite of manufacturing systems designed to execute operations tasks intended to address strategies, such as production, maintenance or inventory tracking. Manufacturing execution systems (MES) are a subset of an operations execution system, as they are typically concerned with executing tasks within just the production line. Other systems which might be included within an OES might include warehouse management system (WMS), supply chain management systems (SCM) or computerized maintenance. can be intended or can emerge as a pattern of activity as the organization adapts to its environment or competition to achieve its mission. It involves activities such as strategic planning and strategic thinking to achieve business sustainability. takes the concepts from sustainable management and synthesizes them with the leadership concepts of safety, operations, maintenance, engineering and business management. For example, the practices of a business should be sustainable if they wish to stay in businesses, because if the business is unsustainable, then by the definition of sustainability they will cease to be able to be in competition. A simpler definition of sustainability is a call to action (CTA), a task in progress or journey. To be realistic and achievable involves a political process; clear definitions and vision must govern the common goals and values that are understood by all to achieve the desired levels of sustained profitability. Finally, The Business Dictionary defines profitability as the state or condition of yielding profit or gain. It is often measured by price to earnings ratio, and the issue becomes how well it is sustained over longer periods of time. How Will You Know When You Get There? So how do you know when you have achieved the desired level of execution excellence? Is it gut-feel-as-you-go? Or, do you have other less subjective and equally effective ways of knowing when you have gotten there? Maybe a better question is, have you ever achieved your desired level of execution excellence? 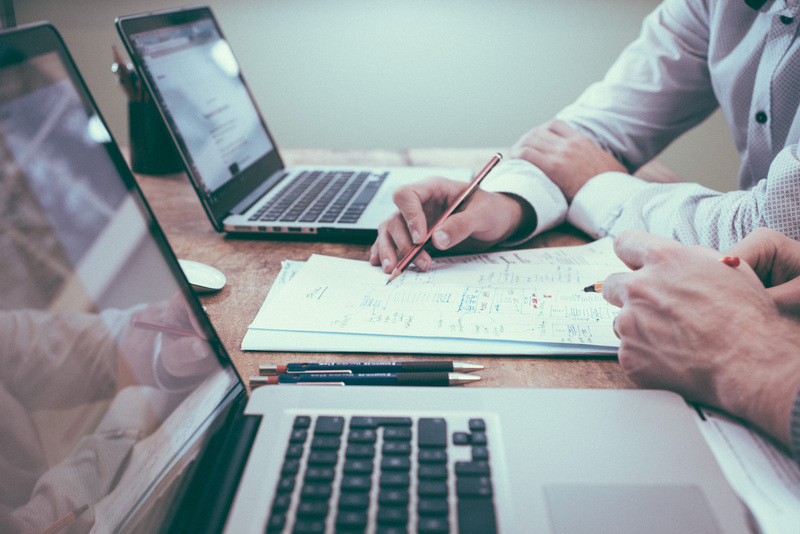 If you answer no, perhaps after reading this article, you will have better insight, and we can work together and connect to help you determine and align and execute your measurable strategy to sustainable profits. If growth is dependent on strategy execution, how can a business proactively deliver the growth if they are not effectively measuring the organizational excellence in leadership agreement and execution of the strategy? There is a whole host of sustainability strategies out there for using existing resources optimally the achievement of long-term growth in a responsible and balanced way. Within a business context, economic sustainability involves using the many assets of the company efficiently to allow it to continue functioning profitably over longer periods of time. How can you know any of the above if you are not effectively measuring? 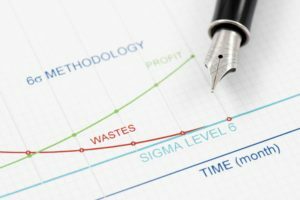 Traditional six-sigma efforts use statistical tools (most often the bell-shaped Gaussian distribution) to help find root causes of problems, provide mile-marker metrics. Since most production output data is not bell shaped data, we need a more advanced tool to help define the problem-solving indicators. We have developed a unique execution key performance indicator (KPI) derived from the results of these advanced statistical methods and production output. This KPI moves across the continuum states of excellence from reactive-preventive-predictive-proactive based on the level of leadership focus and intensity of driving improvements. 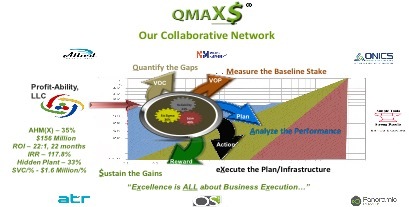 If you want to effectively execute the “Dollarized Pareto Plan” to achieve sustainable excellence, please review my newly patented brand QMAX$® for driving overall Asset Health & Risk Management Value Delivery. 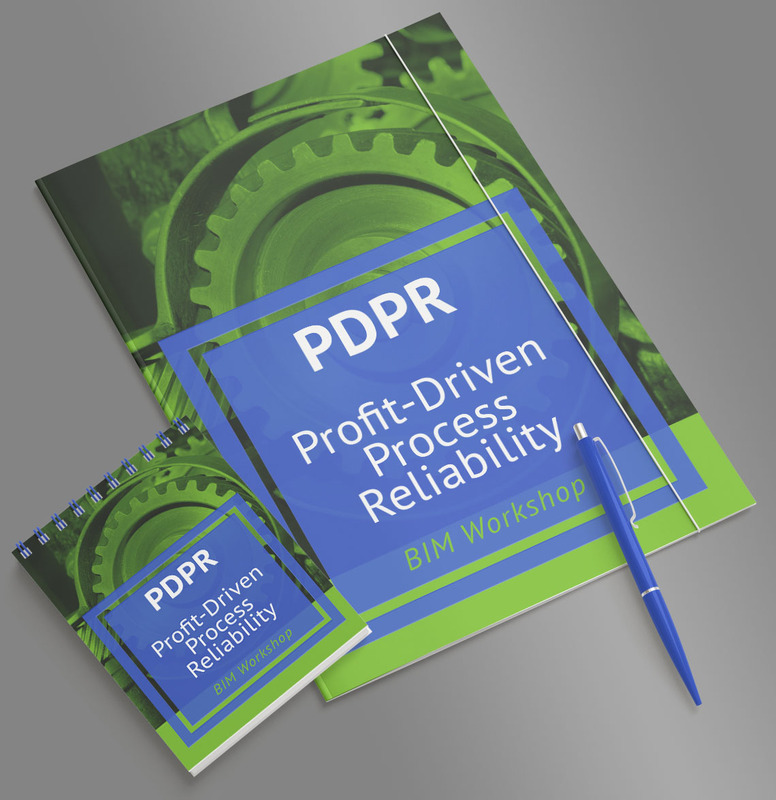 We introduce Profit-Driven Process Reliability, based on the teachings and findings of the work of the late H. Paul Barringer. Paul would always say that the biggest opportunity for improvement is a management problem thereby leaving a lot of money on the table. We clearly understand that collectively leadership can be focused to help a business quantify baseline execution excellence and define an advancement strategy to higher levels of execution excellence and sustained profitability. Find out what message our CEO, and co-author of “Expanding Capacity”, Jose’ Wilkins has to convey that is so cutting edge that Uptime Magazine made it into a feature article in their September/August issue! *Profit-Ability, LLC views are consistent with H. Paul Barringer and the following content is a derivative of his work. It is common for availability, maintenance and reliability to be discussed interchangeably across industry. In this article, we will share our opinion using simple definitions to explain why they are not the same. 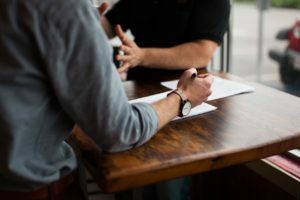 We will also dive into deeper dialog to clarify the level of reliability you are seeking when you consider starting a reliability improvement approach. Management must shift from time and maintenance driven paradigms and focus on business reliability efforts with relentless focus for ALL failure elimination and waste reduction to maximize earnings. This allows for characterization for overall ROI. Firstly, Availability will focus on time utilization. Secondly, Maintenance will focus on repairs. Lastly, Reliability will focus on failure elimination. • Unreliability is the costly part of the business economic equation. • Reliability numbers by themselves will not motivate improvements. reliability numbers to spring into life and justify actions for making cost effective changes. As a general sense, reliability is the ability of an item to perform a required function under stated conditions for a stated period of time. As a characteristic, reliability denotes the probability of success or the success ratio. As a measure of quality, reliability exists by design as an objective or a requirement of a product from its inception to the end of its working life. As a probabilistic statement, reliability is concerned with the probability of future events based on past observations. As a basic concept, reliability is durable and high probability of failure-free performance under stated conditions including all item life units, not just mission time and all failure with the item, not just mission critical failures at the time level of assembly. As an overall concept, reliability is a special development of engineering industries for the collective measures of quality that reflect the effect of time in storage or time in use of a product. The concept is distinct from measures that show the state of the product at time of delivery. 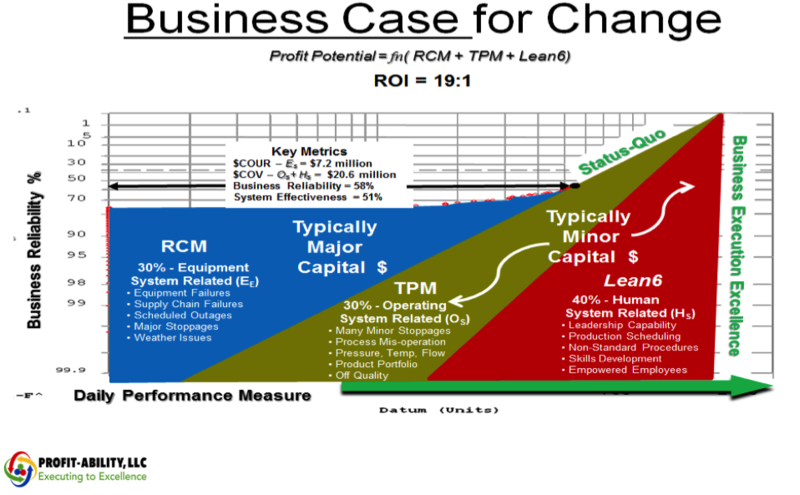 As a business concept, reliability is concerned with a balanced integration of strategies for procurement, installation and start-up, equipment/process operations, maintenance, and reliability which avoid failures and maintenance interventions by focusing on the long term cost of ownership in financial terms to avoid waste and optimize facility capability. 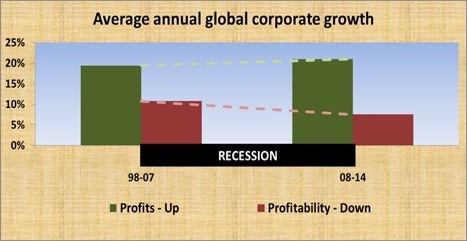 The net result is improved BUSINESS PROFITABILITY & SUSTAINABILITY. The simplest reliability definition to use is the characteristic. Most I’ve heard relate with basic. The most productive reliability definition relates to the business concept and the natural connection for business leaders. What is your value concept for reliability?